Persistence Market Research (PMR) offers an 8-year forecast on the global digital intraoral sensors and consumables market. The primary objective of the report is to offer updates and information related to opportunities in the global digital intraoral sensors and consumables market. In terms of revenue, the global digital intraoral sensors and consumables market is expected to register a CAGR of 5.0% during the forecast period of 2018–2028. The primary objective of the report is to offer insights on the market dynamics that can influence the growth of the global digital intraoral sensors and consumables market over the forecast period. 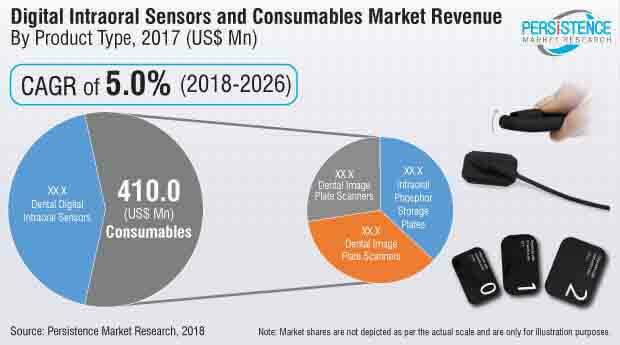 Insights on the key trends, drivers, restraints, value forecasts and opportunities for companies operating in the global digital intraoral sensors and consumables market are presented in the report. Globally, the rising technological advancements for increasing demand for dental intraoral sensors and consumable devices for improved treatment of oral problems is anticipated to upsurge the growth of the global digital intraoral sensors and consumables market. There is an increasing medical evidence that oral health can affect overall health, and that the condition of gums and teeth may be an early warning for other diseases and medical conditions. Tooth decay is the most common childhood disease and is considered as the most widespread chronic disease globally. Whereas, periodontal disease begins as a chronic inflammation of the gums. Periodontal diseases are prevalent in both urbanized and developing countries and generally affect around 20-50% of the worldwide population. Increase in the prevalence of periodontal disease and tooth decay in adolescents, adults, and older individuals increase the demand for dental digital intraoral sensors, intraoral cameras, intraoral scanners, and intraoral storage plates. This further is expected to drive the growth of the global digital intraoral sensors and consumables market. Furthermore, rising dental expenditure is driving the growth of the global digital intraoral sensors and consumables market. Total dental expenditure increased in 2016 to 3% from 2015. Growing emphasis on dental health is also accelerating the growth of digital intraoral sensors and consumables market. Integration of oral health into primary care increases the potential demand for digital intraoral sensors and consumables. To understand and evaluate opportunities in the global digital intraoral sensors and consumables market, the report offers the market forecast on the basis of product type, and end user. The report provides analysis of the global digital intraoral sensors and consumables market in terms of market value (US$ Mn). The report begins with the market definition, followed by definitions of the different digital intraoral sensors and consumables types. The market dynamics section includes PMR’s analysis on key trends, drivers, restraints, opportunities and macro-economic factors influencing the growth of the global digital intraoral sensors and consumables market. Opportunity analysis provided in the section allows clients to better equip with crystal clear decision-making insights. In addition, we have considered Year-on-Year (Y-o-Y) growth to understand the predictability of the market and identify growth opportunities for companies operating in the global digital intraoral sensors and consumables market. Another key feature of this report is the analysis of the key segments in terms of absolute dollar opportunity. This is usually overlooked while forecasting the market. However, absolute dollar opportunity is critical for assessing the level of opportunity that a provider can look to achieve, as well as to identify potential resources from a sales and delivery perspective for services offered by the digital intraoral sensors and consumables market. To understand the key segments in terms of their growth and performance in the global digital intraoral sensors and consumables market, Persistence Market Research has developed a market attractiveness index. The resulting index will help providers to identify the existing market opportunities. Advancements in medical image technologies are continuously increasing the demand for digital intraoral sensors and consumable devices. The digital intraoral sensors, intraoral phosphor storage plates, dental image plate scanners, and intraoral cameras are majorly designed to treat oral problems. Digital intraoral sensors are x-ray imaging equipment that conveys improved resolution images to dentists for better treatment. Digital intraoral sensors are more advanced in comparison to conventional radiography films, as intraoral sensors send images directly to the connected computer or other devices. Intraoral sensors are wired directly or work on a wireless technology to communicate with a computer. Digital intraoral sensors offer superior diagnostic images that are essential for a successful endodontic treatment and implant surgery. Consumable dental devices include intraoral phosphor storage plates, dental image plate scanners, and intraoral cameras. Intraoral phosphor storage plates eliminate the need for conventional film processing for dental radiography. Phosphor storage plates can change existing film-based cephalometric and panoramic images to digital images. Intraoral phosphor storage plates provide high-resolution images, instant observation of X-rays, and wireless capabilities. Intraoral image plate scanners are used to scan phosphor storage plates. Intraoral cameras are the same as dental mirrors in terms of shape and size. It has a built-in light source and a tiny camera that allows general dental practitioners to zoom on a particular area in the mouth. The captured images are viewed on a computer or another output device to observe problems such as plaque deposits, cavities next to fillings, and cracked teeth. The report classifies the global digital intraoral sensors and consumables market by product type, end-user, and regions. The report provides market size and forecast for digital intraoral sensors and consumables. The report analyses the demand for digital intraoral sensors and consumables from dental laboratories, dental hospitals, dental clinics and others. In terms of revenue, the global digital intraoral sensors and consumables market is projected to expand at 5.0% CAGR over the forecast period of 2018–2026. The digital intraoral sensors and consumables market is expected to be valued at US$ 1,113.6 Mn by 2026 end. The introduction of technologically advanced and new innovative medical imaging devices are expected to boost the growth of the global digital intraoral sensors and consumables market over the forecast period. By country, the U.S. is expected to dominate the North America digital intraoral sensors and consumables market with a lucrative growth over the forecast period. Increasing number of dental firms with rising demand for dental digital intraoral sensors and consumables amongst physicians is anticipated to drive the growth of the global digital intraoral sensors and consumables. The demand will continue to outstrip the supply and with strong industry dynamics, the market will remain strong across the globe. Moreover, growing emphasis on oral health further increases the potential demand for dental digital intraoral sensors and consumables. Dental care utilization is high among children and is generally low among working-age adults. This indicates the increasing number of people going for dental procedures, increases the demand for dental digital intraoral sensors and consumables in dental hospital and clinics which further boosts the market growth. Furthermore, rising technological advancements for better treatment opportunities is also driving the growth of the global digital intraoral sensors and consumables market. Government initiatives for accessing the oral health in rural areas is also expected to upsurge the growth of the global digital intraoral sensors and consumables market. Some of the organizations addressing rural oral health issues are: American Association for Community Dental Programs (AACDP), Association of State and Territorial Dental Directors (ASTDD), Federal Office of Rural Health Policy (ORHP), Health Workforce Information Center (HWIC), Indian Health Service (IHS), National Network for Oral Health Access (NNOHA), and Rural Assistance Center (RAC), and others. However, the rising cost of medical services with limited capacity and resources for primary health care facilities are the major factors expected to hamper the growth of the global digital intraoral sensors and consumables market over the forecast period. It is observed that the primary health care facilities for patients are still not established in order to provide adequate treatments. Geographically, the global digital intraoral sensors and consumables market is segmented into six major regions viz. North America, Latin America, Europe, APEC (Asia-Pacific excluding China), China, and the Middle East & Africa (MEA). In terms of value, North America was the dominant regional market for digital intraoral sensors and consumables in 2017 and is expected to grow at a CAGR of 4.2% over the forecast period of 2018–2026. This is followed by Europe and is the second most dominating region in digital intraoral sensors and consumables market. Asia Pacific is expected to contribute significant revenue share in the global digital intraoral sensors and consumables market over the forecast period. However, Latin America and the Middle East and Africa region are expected to witness slow growth in the global market for digital intraoral sensors and consumables. Examples of some of the key players identified in the global digital intraoral sensors and consumables market are Carestream Dental, LLC, Danaher Corporation, DÜRR DENTAL SE, Acteon Group, Suni Medical Imaging, Inc., Owandy Radiology, Dentsply Sirona, Ray Medical, FONA Dental, Midmark Corporation, and others. Established market players are looking for opportunities like geographical expansion which can increase their market share in the global digital intraoral sensors and consumables market. Furthermore, adoption of various strategies like mergers, collaboration, acquisition, agreement, and others are observed in digital intraoral sensors and consumables market by local and emerging payers in order to increase their market presence. Manufacturers are also focusing on research and development activities to develop technologically advanced digital intraoral sensors and consumables devices.